We are the only specialist beeswax company in New Zealand and as such, have a wide and varied customer base for our products. Because of this, we need constant supplies of crude beeswax for processing so we are always interested in buying beeswax. Because we have a wide range of markets, we are interested in all grades of beeswax, as we have the ability to match different grades to the most suitable market. We accept beeswax as payment for Comb Foundation, Total Frames, Alliance Woodware and Beekeeping Equipment. There are a few basic points to follow when melting as detailed below. Another point that you should note is that quality is not just based on how clean your beeswax is. Every time you melt beeswax you reduce the quality, so try to get it right the first time. For many of our uses we would prefer once melted beeswax with some bees in it and dross on the bottom, than the same beeswax which has been re-melted. If melting over water, ensure that the water never boils as this will emulsify and stain the beeswax and lower its grade and value. Never use live steam direct into beeswax as this will also emulsify it and downgrade it. Melting and holding vessels are best made from stainless steel or heavy plastic. Steel, iron and galvanised vessels should never be used as they are attacked by the acidity of beeswax and this will discolour the beeswax. 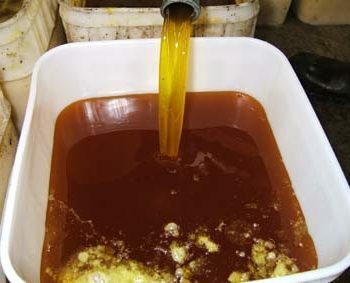 Melted beeswax is best put into a holding tank with hot water in the bottom. This allows any fine dross and stain to settle out. Holding tanks are easily made by using a plastic drum with an outlet at the bottom and another wax outlet about 300 mm up from the bottom. 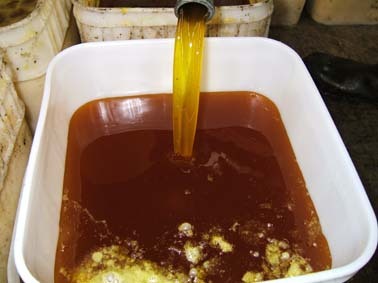 Fill with hot water to just above the top outlet (the more water you have – the greater its ability to absorb stain) and add the molten beeswax and leave to settle until the correct pouring temperature (70 deg C approx) is reached, then lower the water level out the bottom tap while dribbling a small flow out the top tap. Once you have clean wax coming out the top tap lower the water a little more and close the bottom tap. Pouring of clean wax can commence out of the top tap. When finished add some hot water to the tank to run out the last of the wax into a mould with some water in the bottom and this will be the only block with dross on the bottom which can be cleaned off. The trick to producing nice blocks is to pour at the correct temperature, which is about 70 deg C. If you do not have a thermometer, a sign that the temperature is about right is if the bubbles which form as you are pouring, solidify momentarily on the surface and then melt. If this does not happen then the beeswax will be too hot, will cool unevenly, the blocks will have cracks and be hard to remove from the moulds. Our preferred mould is a square pail as pictured. If filled to the lowest reinforcing ring around the top of the bucket they hold approx 10 kgs. These are an excellent size for “top and tail” packing onto standard pallets. 10 kgs is also a good weight if you want to estimate how much beeswax you have by counting the blocks. These moulds are also inexpensive and can be supplied by us. All Transfer Statements must now be done electronically as an Electronic Declaration. If you are not registered, information on E-cert and how to register can be found at http://www.foodsafety.govt.nz/industry/exporting/e-cert/ or contact your RMP verifier for more information. The Electronic Declaration must be raised within 24 hours of the beeswax leaving your premises. Our RMP Identifier is 5BW. Beeswax that does not come with an ED will be graded Non-Complient. For help with Raising and Eligibility Declaration see these notes or phone Susan. Raising an Eligibility Declaration Help Notes 1305 – updated 8 May 2013. Required for old combs, old frames and scrapings for rendering. Marking: All consignments need to be clearly marked with your name, and if you are RMP registered, your identifier. We can have a number of deliveries each day so it can be very difficult and time consuming identifying your consignment if you do not have your name on it. 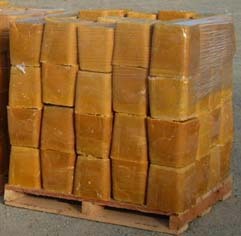 Packing: Although most consignments of beeswax will be charged on weight, freight companies work on the greater of the weight or cubic measure, therefore it is prudent to pack the beeswax neatly so that the consignment is as small as possible. Blocks of wax do not pack well into round containers, like maxi drums, you will end up paying for the air gaps. 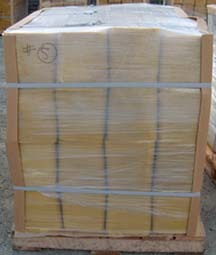 Beeswax can be packed in bags on pallets or blocks can be wrapped and strapped directly on pallets. Ensure the Consignment Notes are filled out as accurately as possible as this is how it will be charged. Some freight companies will re-measure and re-weigh if it doesn’t appear correct. The cubic measure is the overall width x depth x height. Rates: We have some good rates with some freight companies. If you would like to take advantage of this contact us for details. You can then send the consignment freight forward and we will charge the freight against the wax credit.